These cars raced before my time so I know little about them. Joe Playan ? Jerry Entin contributed these Lester Nehamkin photos to my website but I needed help on car ? driver ? venue identification. I assumed (correctly) Rod Carveth is in #54 as that was his usual racing number. I had no idea where or when this photo was taken until Bob Engberg helped me out. Still a mystery: who's in #53? New!!! See Kean Rogers' info below! "The first picture was taken at Palm Springs on November, 3rd 1957. Rod is in Car #54, DB3S Team car 11 and Jan Wells is in car #53, Production car DB3S/104. Jan came second in the Ladies race and Rod 12th (in the main event). The second picture is at Laguna Seca , November 10th 1957. Rod is in car #54 again with Gil Geitner behind him in car # 154. Rod placed 6th and Gil 7th." 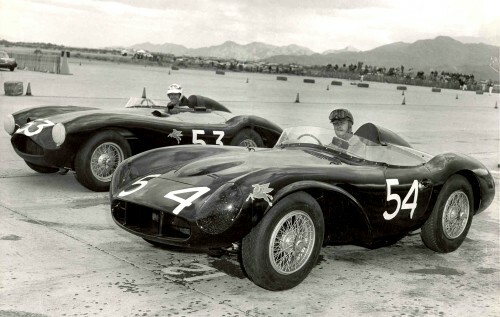 "The first Aston Martin photo was taken in Palm Springs in November 1957, when both of these cars were entered by Rod Carveth. The #53 car is a "DB3S" and the #54 car a "DBRS." "Briefly, and I'm afraid not very specifically.... The DB3S was built in two series. The first lot, numbered 1-10, were built for the works team between 1953 and 1956 and during the last two years a production run numbered 101-120 was added. 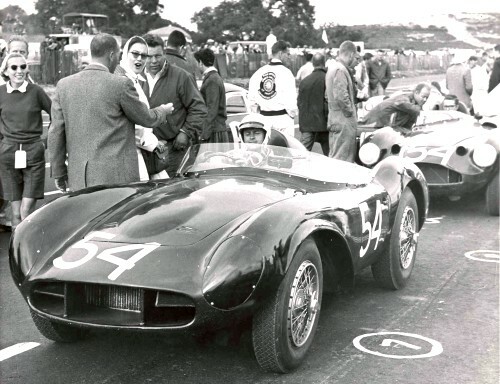 Carveth raced a production model (DB3S/104) 1956-58 and this was also driven by several other drivers, including Flaherty, Laws, Barneson and Wells. In 1957 he added a second car, which was actually the last built, and numbered DB3S/11 because it was a continuation of the works-spec run (twin-plug head, disc brakes etc) rather than a production type. During 1956 two of the works cars (and possibly more?) had been updated with the wider and flatter nose as seen in the pictures of car #54. Carveth's second car (DB3S/11) was also given this treatment. I would guess that your pictures show the two Carveth cars in 1957 or 1958." Learn more about these cars on Aston Martin's DB3S page! Here are the same two cars at Laguna Seca, Nov. 10, 1957. Rod Carveth is in #54. Kean Rogers identified the driver of #154 as Gil Geitner. Can anyone identify any of the onlookers?